The world's first internet toothbrush makes its debut ! - 9jabook & Tweeterest Digital Network ! The world's first internet toothbrush makes its debut ! That’s the message from the makers of what is billed as the world’s first internet-connected toothbrush. Unveiled Sunday at a preview event for the Consumer Electronics Show, the device from French-based startup Kolibree aims ‘‘to reinvent oral care’’, according to co-founder Loic Cessot. ‘‘The technology in the industry has not evolved for years,’’ Cessot told AFP. The Kolibree toothbrush includes a sensor which detects how much tartar is being removed in a brushing. It also records brushing activity so users can maintain a consistent cleaning each time. 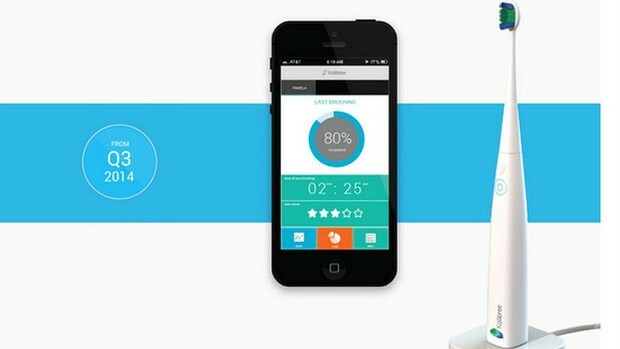 The device conveys the information wirelessly to a smartphone app - a particularly useful aid for parents who want to monitor the teeth cleaning efforts of small children, according to Cessot. But the app can tell users if they have missed hard-to-clean areas or are not getting a thorough brushing. The app, which is open for developers to add on other programs, aims to increase motivation and make the experience more fun, said Cessot. The self-funded startup created by Cessot and former Microsoft and Google executive Thomas Serval plans to release the toothbrush worldwide in the third quarter, getting a boost from a crowdsourcing effort. Orders will be available initially through Kickstarter from $US99 ($A110) to $US200, depending on the model and will include a free mobile app.